As my second day in Cape Town, South Africa came to a close, I made my way over to Table Mountain. I purchased my tickets to ride the cable car up and quickly boarded as it was the last trip of the day. I made it up just in time to see the sun set. As I rode up in the cable car, the car was filled with many people of different backgrounds—a fairly diverse bunch of people. I thought it very interesting and amazing that so many different kinds of people are all attracted to the same tourist site. But it also doesn’t surprise me because Cape Town is such a diverse place in itself, so many of those people could have been locals for all that I know. As I arrived at the top of the mountain, I was amazed and awe struck at the view that I was beholding. There was a storm nearby and as the sun was setting, lightning strikes were visible out on the horizon. The top of the mountain offered a view of the entire city and the surrounding areas. It was mesmerizing to be able to see so far out into the ocean as well as into the country. I think that this tourist attraction is sustainable because of the way that it is carefully managed. The amount of people that go up the mountain is more or less controlled due to how many people can board the cable cars. I didn’t come across any waste at the top of the mountain which suggests that the mountain is being managed efficiently. The people that were working at the mountain all appeared to be local South Africans. But the only way that I can even assume this is through their accents when they spoke, not necessarily by appearance since South Africans are very diverse and can look like just about anyone. Since those employed are local South Africans, I believe that the tourism at Table Mountain is benefiting the local community by producing revenues through their sales of cable car tickets and souvenirs. I wonder if the amount of traffic coming through the mountain will eventually begin to erode and damage the mountain, but as far as I can tell, that is not an issue that is being considered today. What is considered a countries most valuable possession? Is it its people, landscape, minerals they can extract from the ground? In places like South Africa, their wildlife is one of their most valuable assets. People from all over the world flood this country to test their luck to see if they can spot a great white shark, lion, elephant, water buffalo, leopard, and rhino. Because of the money these animals bring in, they are treated like kings and queens, have land the size of Singapore set aside for them, and are tracked and monitored to make sure nothing caused by humans cause harm to them. I think that having a natural resource like these animals as a countries prized asset is one of the best things for the environment and the people in the community. Compare a town whose jobs are centered around safaris versus mining. The mining town becomes polluted after years of extraction, the population becomes sick because of the pollution and less than adequate work conditions, and eventually that resource will run out and then what happens to the community? On the flip side let’s compare a safari town. The resource that the community thrives on, wildlife, is renewable and with the right precautions will not run out, the area is monitored so there aren’t as many if any pollutants, and jobs are created because of these animals. I find it to be the best of both worlds when you preserve nature and its beauty because it not only benefits the environment but the people surrounding it. 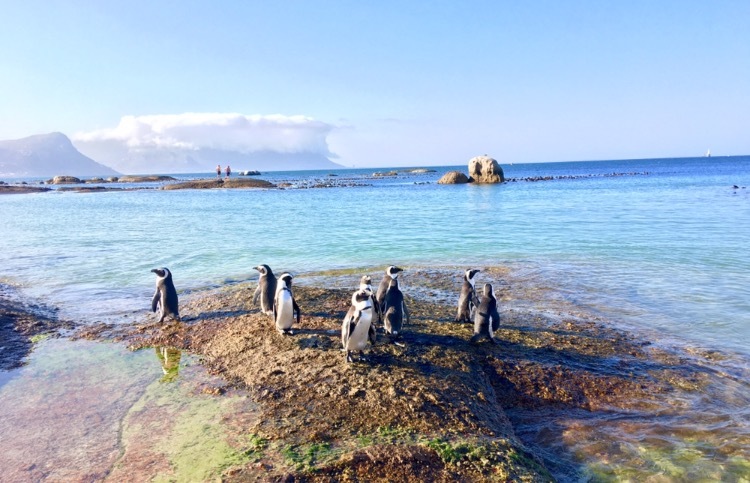 Which does not belong in our beach setting: cool waves slowly crashing, bright sun beating down, sandy shores merging into rock formations, and… penguins splashing around? Aren’t those artic animals? Nope, not in South Africa.Seaforth Beach and Boulder Beach are just two of the many beaches located on South Africa’s expansive shores, but the draw for the many tourists that visit is the herd of small, black and white friends that waddle around the area. Although Boulder Beach is the beach famous for its penguins, Seaforth Beach, located less than a five-minute walk down the path, hosts just as many penguins, only minus the entry fee. Here you can not only admire the penguins from the shore, but also swim right next to them or even lay out by their side on the rocks. There is a surreal feeling in the air, a combination of our familiarity with seeing penguins only in zoos or in arctic settings. I assume they never need to do a penguin huddle for warmth here. Upon arrival, we set down our belongings and carefully waded into the water, as to not disturb or scare away the penguins. There were penguins all around us; some splashing around, others swimming through the water, and another group socializing on the shore. They seemed to be fairly comfortable, if not a bit hot with the sun’s hot rays beaming down. The penguins also seemed unaffected by the humans hanging out on their turf, and generally ignored us. Watching the penguins play together up close was an unforgettable experience, and definitely worth the trek out from Cape Town. 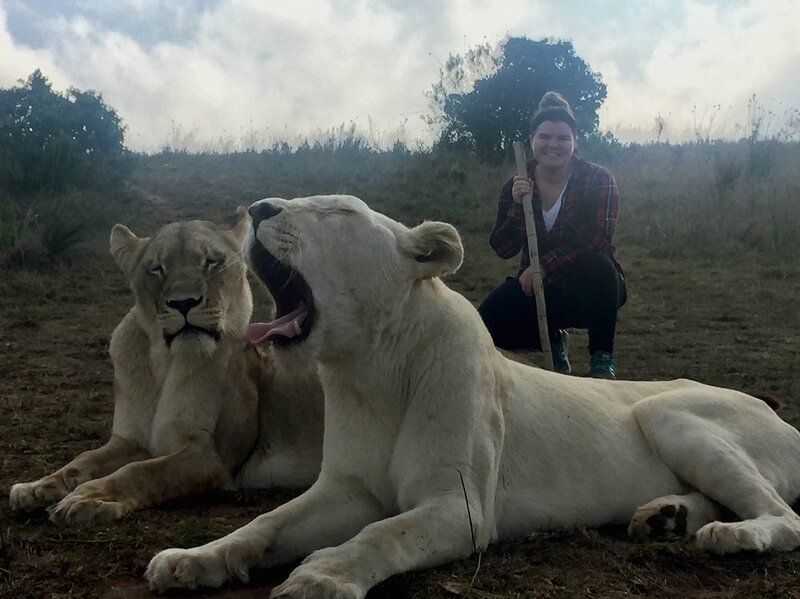 Before traveling to South Africa I had really high expectations for their tourism industry. South Africa did not let me down. The first day after we docked in Cape Town I planned to go to Boulder Beach. We used Uber to get there. After an hour ride we arrived in boulder beach. We got the unique experience to see the African penguins. It was crazy how close they let us get to the penguins. The second day I left early in the morning to head out to the more adventurous parts of South Africa. We went to Mossel Bay to go Shark cage diving. Although the drive was long from Cape Town, it was worth it. We saw multiple great white sharks. The sharks got really close and hit the cage multiple times. After shark cage diving we went out to Botlierskop Private Game Reserve. At the game reserve we got saw all of the big five animals. My favorite were the lions. That night we crashed at a backpacker village/ hostel. It was a great first experience staying at a hostel. The next day we went sky diving. Sky diving was one of my favorite activities in all of South Africa. It was a thrilling experience. Nothing compares to the adrenaline rush of the plane taking of and then jumping out. The views were amazing from 10,000ft up in the air! After sky diving we continued on to Bloukrans Bridge Bungy. Bungee jumping was a completely different thrill. I enjoyed it, but sis not enjoy hanging upside down waiting to be lifted back up the bridge. My overall views of South Africa and cape town were amazing. I will definitely be coming back very soon. I had a wonderful experience traveling in South Africa. I visited an area of Cape Town, Bo Kaap. It is formerly known as the Malay Quarter and a former township, located on the slopes of Signal Hill above the city center and is an historical center of Cape Malay culture in Cape Town. The area is known for its brightly colored houses and cobble stoned streets. I also visited the museum, and it is the oldest house in the area and still in its original form. Usually the entrance fee is 10 rand, but we did not have to pay because the day we visited was Human Rights Day. The museum exhibits the cultural contribution created by early Muslim settlers. Most of them were skilled tailors, carpenters, shoe makers and builders. As a result of economic development in Cape Town and abolishment of racial segregation under apartheid, property in the Bo Kaap has become very sought after, not only for its location but also for its picturesque cobble-streets and unique architecture. However, I met two local people raised in the area, and they said that they do not want to live there anymore because there is always full of tourists in the daytime. Even if they come back to home from school with exhaustion, they cannot take a rest because tourists and buses are always outside of the house and very noisy. Before I came to South Africa, I had thought that people do not live there anymore, and the area is an exhibition for tourists. But in fact, people live there. According to the local people, they have tried to ask the government for help, but it has not done anything for them. I think Bo Kaap is really attractive place, and there is an important history that we should learn. However, I thought the government needs to make a positive action for the local people to protect their life. During my experience in South Africa, I drove six hours to Botlierskop Private Game Reserve for a three day-two night safari. During this time, I opted into a Cat Walk Tour where I had the opportunity to walk with two lions, Cleopatra and Clementine. I spoke with the guide for our tour about the possible drugging of these animals to tame them during the walks; however, he assured me that they never were or will be drugged but rather experienced being around people. 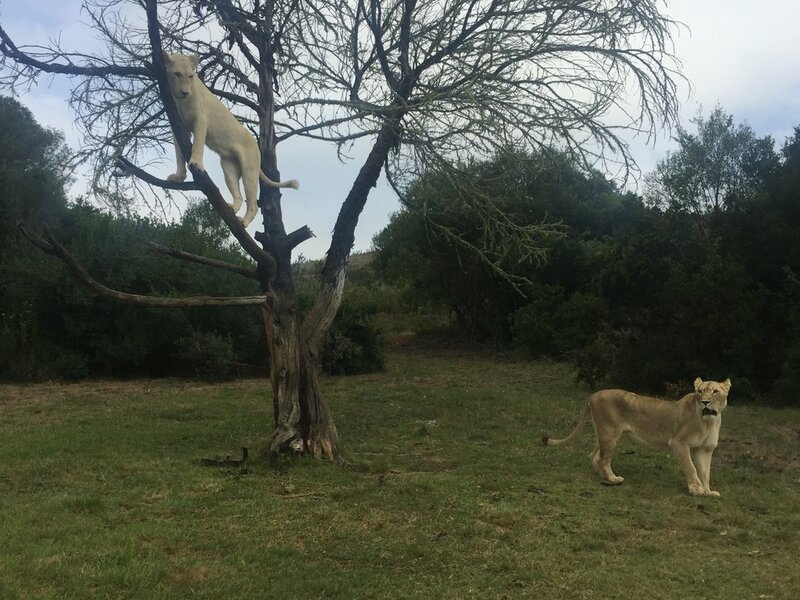 The Cat Walk is an additional fee above the price of the safari and is one of the most expensive additional excursions available at the reserve. While I was there, it seemed to be a very popular excursion amongst our group; however, after inquiring with the owners of the tour company, I found that it is not overloaded with tourists as there are only two tours per day with a maximum of eight participants each. During our time there, they did a total of four tours per day, but each lion still only did a maximum of two walks per day. According to the Plog’s model, tourists who participate in this type of tour are closer to the allocentric side of the continuum as this may be considered to be out of the typical travel destinations and experiences. Although the lions were tame for much of the walk, it is still a large guessing game as you never know when a lion can go out of control and become aggressive. This was a wonderful tour because not only were the guides very knowledgeable, but they also made sure that we felt and remained safe while we were with the lions. Great white sharks may be the biggest, scariest, apex predator in the world, but are they really out to eat people… I mean get people? Marine Dynamics cage diving business located only in Gansbaai, South Africa doesn’t think so. Sharks, and in particular Great White sharks are more curious than anything else. Although there is chum, a seal decoy, salmon heads, and fish oils, cage diving has little effect on the safety of humans on the surrounding beaches. There hasn’t ever been an attack in the area of Gansbaai. As a matter of fact, Marine Dynamics brings in thousands of visitors each year including Discovery and National Geographic for ecotourism, and conditioning association has little effect on the Great Whites. What actually happens is there is reverse conditioning which is when the Great Whites do not come to the boats and are not affected by the constant access human have to close bay waters. Great Whites are always patrolling, forging, and hunting around the area to begin with. Similarly, cave diving has always been a great place to experience cage diving adventures, the second best to be exact. Local people definitely benefit from the tourist’s coming in. There were a total of six workers alone on our boat for our three hour adventure, including a marine biologist, a young girl training, a photographer and videographer and the baiters. My experience was great with these lovely, curious, beautiful, nonviolent creatures. When someone refers sharks to jaws and thinks of these Great White’s as terrifying creatures just remember more toasters kill people each year on average than sharks do. 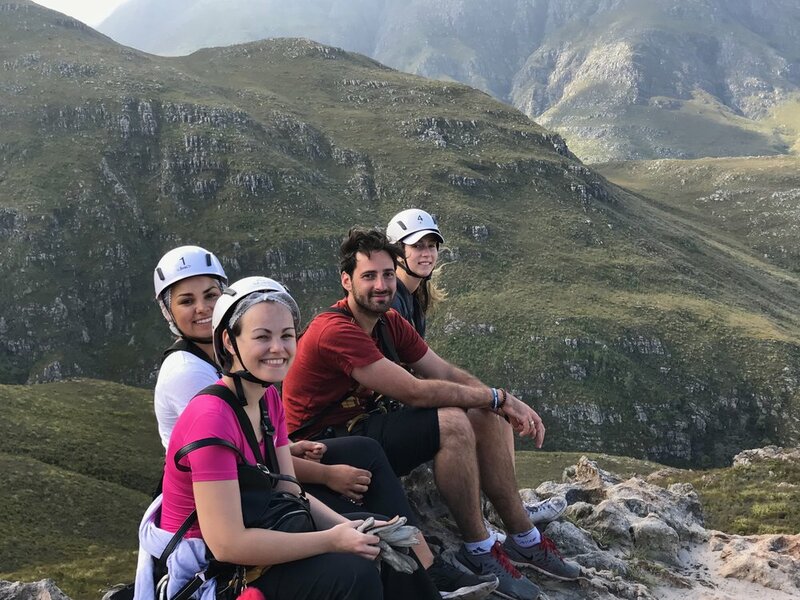 Less than one hour’s drive from Cape Town, you can satisfy your desire for adventure at the Cape Canopy Tour which ziplines you through five (5) miles of the scenic Hottentots Holland Mountain which are in the Western Cape of South Africa. They earned a Certificate of Excellence from Trip Advisor which is well deserved. Although I was super scared, they take every safety measure possible for you and for their employees. It was an amazing day. Highly recommend this, but do not try if you cannot hike or hang off of a rope across a deep, rocky cannon. PS There was an 87 year old woman in our group and she made it. What about you? Phinda Game reserve is located in South Africa slightly south of Kruger National Park in a region called KwaZulu-Natal. Phinda Forest Reserve Lodge has 16-stilted glass chalets that were hand build by the local Zulu people to minimize the impact on the rare Sand Forest. Other amenities include a plunge pool overlooking open grassland; an outdoor wood Boma, a gift shop, as well as many services including all food and beverages. The adventures at the reserve include game drives, river cruises, scuba safaris, endangered wild cats projects, birding specialist safari, horse riding, cultural Zulu Village tour, and many more. Phinda was established in 1990 with the purchase of 32,000 acres of degraded farmland. It was named Phinda after the Zulu word for “the return.” Phinda became the first Big Five private game reserve to be established in KwaZulu-Natal. They demonstrated that using land for wildlife produced better returns than cattle farming on the land especially in marginal rainfall areas. Now Phinda has grown to be 56,800 acres. They are regarded as an “against all odds” conservation success. They brought together a partnership between private enterprise with the neighboring communities of Makhasa and Mnqobokazi. There are 7 ecosystems throughout the game reserve: palmveld and grass-savannah, sand forest, mountain bush, dense thornveld, mixed-bushveld, and open-woodlands. The typical temperatures rang from ~95 degrees F during the summer, and down to 18 degrees F in the winters. · They care for the wildlife by investing in a conservation strategy to preserve the endangered species through conservation, translocations, and breeding programs. While I was spending time in South Africa, I was able to travel about five hours outside of cape town to a town called Mossel Bay. I traveled here to do some of the adrenaline activities I had heard about in South Africa. One of my favorite activities was the Great White Shark Cage Diving. This is a very popular tourism attraction in South Africa because of the large population of sharks in this area. We first arrived to the attraction companies building to change into our bathing suits. After changing a staff member walked us out of the office and down the street to the closest dock. It was about a ten-minute walk to the boat we were getting on to. We arrived at the dock and boarded a medium sized boat with a large steel cage hanging off the back and chum buckets in the mezzanine. After about a thirty-minute ride out into the bay we anchored near a small island covered in seals. The diving company choose this location because the sharks are naturally attracted to this area due to the surplus supply of seals, which are the sharks’ main food source. Overall the company was absolute pros when it came to the logistics of the day. There was never a moment where I felt unsafe in the cage in the water or on the boat. They also were all extremely keen on providing us with information on the sharks and educating us on their habitat and their roles in the ecosystem. The company I would consider to be a top notch tourism company. I would highly recommend them to fellow Semester at Sea students or family members traveling to South Africa.